Hey Julian, I think you’ve mentioned this before but do you have plans for A) be compatible with wii passthrough mode and B) auto pairing multiple remotes? I am currently using wiinusoft right now but it is glitchy and prone to crashing, I am looking for a solution to an all in one gaming station, using the wii remotes for a wireless hookup, to use all the classic controllers (including the new NES classic mini and SNES classic mini controllers.) on my PC. I know you don’t do this for money, but I would pay for these features =P. Thanks! Yeah, Passthrough is still on my roadmap and i want it implemented. Though i can’t say when. What do you mean by “auto pairing multiple remotes”? I’m having difficulty getting the Wiimote to work in64bit Windows 10. I installed your software. I went into my BIOS an dsiabled the driver signature verification. Then I downloaded your driver. Then I pair the Wiimote in bluetooth. I can see that it’s paired. However, your Control Center shows no devices. When I go back to the Device Manager, it looks like your driver is installed. I’m not sure what else to do. I assume that your driver is not actually installed, but I don’t know how to fix that. Any thoughts? Have you fixed it yet? Can you make sure the Wii Remote is still on after connecting it (some LEDs stay lit). Sometimes it turns off while or after pairing, though Windows still keeps it as connected and available. In that case manually remove the device via Windows Device Settings and reconnect it. In the Device Manager it should show up as “Wiimote Device” under HID. Hello Julian, I am having a big issue with uninstalling your program in windows 10. I went to the device manager and clicked “uninstall device driver” and check marked “Delete all files” under the device “Wiimote Device”, I then click on “replace driver with the default windows HID bluetooth driver. I have also tried to uninstall using your HID program, I have also went through the system32 drivers folder to delete all the files in the “Wiimote Device” driver list. I have tried a combination of all of the following, and no matter what I do, every time I try to pair my remotes with my computer the same device driver pops back up as the default driver under “human interface devices” instead of the windows default bluetooth HID (Albeit with errors since it doesn’t have all the files to run properly). I’ve been at it for hours, I have other working programs to use the wiimotes, but this driver keeps interupting the pairing. Please help! I’m sure I have to delete something in registry or in a driver folder, but I have no idea where that would be located on my PC. Uninstalling the driver via the Control Center or Apps and Feature, should’ve been sufficient. As last resort, open up a CMD or PowerShell with admin rights (right-click on the Windows button on the taskbar). Run the following command “pnputil.exe -e” and check if my driver shows up in the list. If it does, use the “Published name” (something along “oem#.inf”) for the following command “pnputil.exe -d oem#.inf”. That’ll remove the driver package from the driver store. As a side note, never ever go through any Windows OS folders and delete files by yourself. That’ll most of the time corrupt your system. Wow this took hours and hours to figure out. If anyone else has this same problem- my issue was that I had an old version install (3.0.2) I had to find the old version and reinstall “Wiimote device” under device manager in human interface devices (because the program itself wouldn’t install it). I then opened up the old version of the program (3.0.2) and uninstalled it with the program. Now everythings uninstalled and functioning properly. Hey, just wondering if anybody has the whammy bar working in clone hero. I can see the z axis moving when I press it in the controller testing thing in the control panel, but in clone hero when I try to map the whammy axis to the whammy bar (z axis) it does nothing. An unhandled exception of type ‘System.Windows.Markup.XamlParseException’ occured in ‘PresentationFramework’. Additional information: The invocation of the constructor on type ‘HIDWiimote.ControlCenter.Main_Windows.ControlCenterWindow’ that matches the specified binding constraints threw an exception. An unhandled exception of type ‘System.IO.FileNotFoundException’ occured in ‘HID Wiimote Control Center’. Additional information: Could not load file or assembly ‘HID Wiimote User Mode.dll’ or one of its dependencies. The specified module could not be found. Hi, can you check whether the file ‘HID Wiimote User Mode.dll’ is present in the zipped download file, as well as in the folder where the Control Center executable is. In some games, the Z-axis is being used for camera controls but only the triggers can be used with your software. How can I get the R-stick to control them in those games? Currently there is no way to remap the R-Stick to the Z-axis. In the far future I’d like to have free mapping, where you can set up your own custom button mapping. But that’s a very long way down the road(-map). Thanks for the reply. Do you think it’s possible to run something like GlovePIE at the same time as using the wiimote as a controller? Driver problems, I enter test mode and make sure the drivers are activated, Both of my Wiimotes are found and everything seems fine, However when I disable test mode and restart my computer the drivers are having trouble again. This information is just meh, Does it mean I need to stay in test mode permanently? Cause that just doesn’t seem right. Let’s say I get all of this to work properly, How do I get it to work with Clone hero? Because I tried this while in test mode And I got 0 response from the game. Both wiimotes where recognised as Guitar Hero in the HIDWiimote But I got nothing more than that. Yes, you need to have to stay in test mode as long as you want to use the Wii Remote. That means in between you can disable the test mode, but you need to re enable it the next time you’d like to use the Wii Remote. The reason is, test mode is required to get the self signed driver loaded. Otherwise without the test mode Windows refuses to load it. Regarding Clone hero, first step is to check the Windows gamecontroller test dialog, whether it receives any input. If not, there is an issue with the driver, if it does, the issue is with Clone Hero. Anyway make also sure that the controllers are properly set up in Clone Hero, i.e. press “Space” to bring up the controller settings. Hello sir, I don’t know how to make my own comment here, so I have to reply here, I want to go back to the original drivers that I used before, as I really want to play dolphin emulator again, is there any way for me to go back? I cant roll back the driver, and if you know how I can go back, that would be nice. You can uninstall it via the “Apps and Features” Settings Panel or the old “Programs and Features” Dialog (the place where you uninstall all your other programs as well). Hi! I do not know how to post comments so I just replied instead. I can’t get the drivers to download and I’m on Windows 10. Hi. I’m having difficulties getting HID Wiimote to work properly and to connect my Wiimote to my PC on Windows 10. Firstly, the installer Test Mode refuses to stay enabled. When I enable it in the installer, it shows a warning about needing to reboot, but upon reboot the Test Mode is not enabled anymore. I have also tried clicking close after enabling, which returns me to the program, and if I go back into the installer Test Mode is off yet again. Additionally I have tried rebooting immediately after enabling, without closing the program, which still ends up leaving Test mode off when the computer restarts again. Next, the Wiimote itself. I am using a black Wii MotionPlus remote (integrated MotionPlus, not the add-on module, and it is identified as RVL-CNT-001-TR), and when I go through the process of connecting the remote still stays in the connection mode. When I go to switch the drivers following your guide above, still in the connection mode, I get an error that the driver signature was not verified. This prompted me to try disabling the signature, however, the Test Mode is not functioning and the one-time-disable methods above are for Windows 7 and 8, when I have 10 so I can’t go through either of those. I have also tried connecting a standard, original Wii remote without MotionPlus, with the same result. Also, I’ve tried doing this with HID Wiimote running and with it closed, again same results. Disabling the Driver Signature Verification/enabling the Test Mode won’t work if your system is secure boot enabled. To check if secure boot is enabled, check your BIOS/UEFI. As long as the Driver Signature Verification/Test Mode issue is not resolved, the driver won’t be loaded with your given error “driver signature not verified”. So that is related to that. The one-time test mode instruction are working on Windows 10 as well. Though i guess as long as secure boot is enabled it won’t work either. So I turned on test mode but now battle eye wont let me play other games. how can I disable test mode. If you are using the one-time test mode, simply do a reboot. If you permanently disabled the driver signature verification, you can do so with the Control Center. Start the Control Center and under Tools > Installer open up the installer window, where you can re enable it. If the Control Center isn’t working for you, uninstall the driver via “Programs and Features”. Then run the Control Center once again, to bring up the installer window. How do you uninstall? The control center won’t open after the restart so I would just like to uninstall all together, how would I go about doing this? You can uninstall the driver via “Programs and Features” (Where you uninstall your other programs as well). Hello. Why after doing everything the control center isnt opening? am i missing something? I am now stuck in test mode, after clicking control center nothing happens. Hi, there seems to be an issue with the Control Center on certain machines, that it silently closes without any error message. I am looking into it, though i am not able to reproduce it. The driver is still working without the Control Center, you just can’t change any settings for the controller. If you’d like to remove the driver package and turn of the test mode, uninstall the driver package via the “Apps and Features” settings panel (where you can uninstall all your other program). After done so, start the Control Center once again. As it should bring up the installer windows, you can there disable the test mode. Hi, just wanted to post an update of my situation. I decided to try the driver on my laptop and for some reason the Control Center works perfectly as well as the driver. Then, I decided to try installing the driver again on my desktop and while the Control Center still doesn’t work, the driver works fine. Here’s hoping that you can figure out the issue with the Control Center that I had on my desktop. it seems the Control Center issue is just affecting some people/machines. I am looking into this, though on none of my machines does this issue occur. So far i figured that he Control Center silently aborts on any error without any message. That’s something i will change for future version, so there will be at least some kind of error message. Hi, I’m not certain if the problem is simply something I’ve missed, but I’m using a wii u pro controller and it’s just not being picked up. I’ve paired it successfully, the driver has been switched, and the device manager and my bluetooth can see it. However when I select it on the control center none of the settings change anything, the leds on the remote show player one instead of battery power, and steam doesn’t see any connected controllers. This isn’t something I’ve ever done before so sorry if I’m just looking in the wrong spot. reading the other comments, it seems like the control center isn’t working either. I’d assume nothing is connected. check if the Controller is actually connected to your PC and not any console nearby. Also check that the correct driver is loaded for the device. For that look at the device nodes under Human Interface Devices in the device manager. 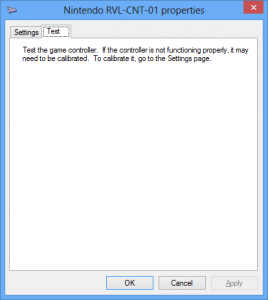 Then check the Game Controllers Windows dialog, whether it shows up and the test input dialog is picking up any input. If the test input dialog is picking up the input, the driver is working properly. In case the controller won’t connect anymore, you have to manually remove/disconnect it from Windows via the Windows settings panel. I recently upgraded to 0.3.0.2 and it no longer responds to the Whammy bar on my GH controller. The game I’m playing requires the whammy be mapped to an axis shift instead of a rotation. Is there a way for me to downgrade back to 0.3.0.0? Alternatively, is there a way I can remap the whammy bar to not be a rotation? Hi, uninstall the current driver package either via its Control Center or “Apps and Features”. Then run the 0.3.0.0 Control Center to install the 0.3.0.0 package. Continue using the old Control Center. Did the Whammy work in 0.3.0.0? To what axis is it mapped and does the analog stick work in 0.3.0.0? There was a bug in 0.3.0.0 that the analog stick data was used for buttons and whammy bar instead of the actual data bytes. So i’m surprised the guitar is working properly for you. Is there any way to make the whammy work besides downgrading? I’d like to use it, but Clone Hero doesn’t recognize the Z rotation it’s currently mapped to. Also, is there any way to get tilt controls working on the GH controller? Does the whammy bar (Z Rotation) works with the Windows input test dialog? I am trying to figure out, whether my driver isn’t properly mapping the whammy bar or Clone Hero simply doesn’t want it as Z Rotation. As a side note, i do not have a Wii Guitar, so i am not able to test it myself. Hey, does this really need a admins permission, i got my clone hero on my school computer, and it works perfectly but i can’t run HID wiimote cuz of admin, is there any other way to get access? Yes, you need admin permission. There is no other way. You need them to install the driver package, as well as to change the driver signature enforcement. Those are actions that do affect the operating system. Sorry I took so long to respond, I have 0.3.0.0 working again. Yes, my whammy only works in 0.3.0.0; the analog stick worked in both versions. I checked and apparently my whammy is mapped to a Y rotation in 0.3.0.0. Does the type of guitar used matter? I’m using a GH5 controller, whereas a friend is using the World Tour controller. He’s not having issues with 0.3.0.2 where as I am, apparently. Ok, that’s pretty strange. Does it show up as Guitar in the Control Center? The actual guitar type can make a difference. I am unable to find any resources about the GH5 controller and its data format. It may be that it does have some other identifier and is using another data format. Hi, I am on Windows 10 with the latest creator’s update and I can’t get the control panel to show after I install the driver. I just opened the installer, installed the certificate and the driver, and then hit close and it went to not responding and then Windows closed it. After this, whenever I double click the control panel exe it asks for admin rights and then nothing happens after I grant it. Hi, others reported some issues as well. I am now able to upgrade to the Creator’s update on my dev machine, to look into it. Meanwhile, does this still occur after a reboot? Can you check the Task Manager if the ControlCenter.exe process is still running (make sure to use the Details tab to view all processes). It does still occur after a reboot and I don’t see ControlCenter.exe or anything HID Wiimote related in the Task Manager Details tab. Open device manager, and look for “WiiMote Device” under *Human Interface Devices*. Please do not ever directly delete any files within your Windows folder, as that may damage your system. You can either remove the driver via the Control Center or its entry in the Program/App and Features list (Where you uninstall other programs). However that shouldn’t be necessary. Have you tried to remove the Wii Remote Bluetooth device in the device list first. You didnt enable test mode on your PC – reread the directions above. Can you check if your system has SecureBoot enabled? That may interfere with test mode. Otherwise try the One Time Deactivation. Is it normal to need to repair the wiimote after it goes to sleep? The PC hasn’t been shut down and wiimote is not out of range but does not sync when turned back on. There are third party wii guitars on amazon that do not work with glove pie. Do you happen to know if this could be used for these guitars? It works! At least with clone hero. I haven’t tested any of the real guitar games. It’s pretty cool to be able to use a new guitar in 2017, thanks for the driver! Your download worked until installing and it just fails, with an error. It says An error occured while running DPInst.exe! After “successfully” pairing the wiimote to Windows, Windows shows that the RVL-CNT-01-TR is paired. However, the lights on the wiimote are not lit up at all, and your program says that they are not connected, nor does any input from the controller affect my computer. Any suggestions? Hello Julian Löhr, i try to using HID wii mote with generic CSR 4.0 but doens’t work. I tried it, but there is no chance to skip pairing code. Make sure You uncheck the code, and Your WII Remote should pair fine. Can´t install Wimote driver in Windows 10 pro Fall Creator. Does it work with a generic CSR 4.0 dongle (they are the most popular on ebay)? I have paired the device and it’s shown as Nintendo under Bluetooth in Device Manager and “Wiimote Device” is now properly under HID there. Yet, USB Game Controllers of Windows does not find it at all. I have one of those generic bluetooth dongles and it works fine for me. Are you following all the instructions for ensuring the right driver is being used? If it shows up as “Wiimote Device” the driver is successfully installed and loaded. If it shows up in the Device Manager, but not as USB Game Controller, make sure the Wii Remote is still on and connected (some or all LEDs lit). If not you have to remove/unpair the Wii Remote manually via Devices & Printers, and then reconnect it. I can’t figure this out. I pair the wiimote, go to device manager to change the driver, then it tells me I need to restart for this to take effect. If I restart, the wiimote disconnects, so I need to connect it again, but the only way I can do that is to remove it from devices and printers first. When I pair the wiimote again, it defaults to the original windows driver, so then I have to go to device manager to change it again. Then it needs to restart for changes to take effect! So, how do I get it to work without it being a paradox of pairing, setting driver, restarting, removing, pairing, setting driver, etc.? Never mind. It’s connecting with the right driver now. Not sure what I changed, but it works. Yeah, it is weird sometimes. Don’t know why, though. Upon further testing, it seems that if I remove a wiimote from bluetooth settings or devices and printers, then reset, then pair it again, it’ll work. If I don’t reset after removing it, it won’t use your driver but will use the windows one instead. If it’s in the state that it’s using the windows driver, then even if I remove it, then reset, then pair again, it still won’t use your driver. The only way I could figure out how to fix that was to remove the wiimote, physically remove my bluetooth dongle and plug it in again, then pair the wiimote again. What kind of .NET issue? Are you getting any error message? The Control Center uses the .NET Framework 4.5.2 runtime. If you don’t have that one installed, you get that on from the Microsoft Download page. Just search for .NET Framework 4.5.2, i recommend the Web Installer. Hello, if this has been answered before, my most sincere apologies! However, I recently bought a Luigi themed wiimote for my daughter(wii motion plus inside) and can no longer use the Touchmote program to map keyboard inputs since it mentions that it is incompatible. At the current moment, I can connect my RVL-CNT-01-TR controller to my Windows 10 creators update PC with no problem, however, it will not assign inputs or a player assignment (1,2,3 or 4). Will this program allow me do assign inputs and a player designation? The end result is for me to be able to use this is Cemu 1.9.1 emulator. Specific steps of the process would be extremely appreciated. Alternatively, you could get x360ce, which would Inject its DLLs in any Game/Emulator’s folder, and let you use your Wiimote as an xbox360 Controller. 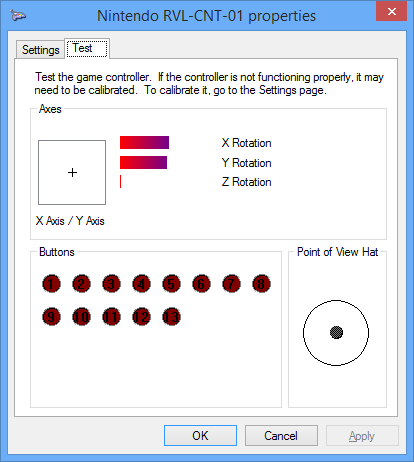 Note that you need to be using Julian Löhr’s Driver for x360ce to pick Inputs from your Wiimote. Thanks for your extensive write up. Though please do not recommend anyone to use the Toshiba Bluetooth Stack (or any other) as those times are gone. As my research shows  the Microsoft Bluetooth Stack works completely fine with “-TR” Wii Remotes on Windows 10 (only issue is Windows 7). Instead contact the developers to fix their program, no one with Windows 10 shall struggle with the Bluetooth stacks again. Thanks so much for your reply! I will try to replace my current driver with yours and attempt to use x360ce so bind inputs to keyboard. Hopefully this solution will work for me! Thanks for all your hard work. Thank you so much for all the information. I remember reading through his thesis and it stated that The Toshiba BTS was no longer necessary and since I do not want to mess with installing and removing the trial period, I will keep trying to use the Microsoft Bluetooth stack and X360ce and see if that works. Thanks again! Definitely stick with the Default Bluetooth Stacks, and use x360ce to bind your controls however you want. If you fall short on buttons, and can’t bind any more keys to the Wiimote, consider using Antimicro as it would allow you to assign multiple functions to any button/axis, i.e., Action on single tap and hold (for whatever duration you please), Action on double tap, Action on triple tap (the sky is the Limit.) Also, you could bind multiple keyboard keys to the same Wiimote button, and depending on the situation, the Game will execute the right command, E.g., Assigning a keyboard button that skips cutscenes and the Escape key to the same Wiimote button would make it versatile in that if there is a cutscene or when you are playing the game, it would skip the cutscene or pause the game respectively. I usually bind the left Analogue Stick to the Wiimote, and leave everything else for Antimicro. If you go Exclusive Fullscreen on a Game, and find that Antimicro isn’t working, run it as Administrator. I just tried to install drivers. I have Test mode on. Windows is telling me that folder is not containing proper driver for x64 windows when i select HIDWiimote.inf. I`m stuck here. I have windows 10 with latest updates, testmode on. Make sure all files from the Zip files were properly extracted. Then run the “ControlCenter.exe” to install the driver via its installer. Otherwise you won’t have any “Programs and Features” entry to remove it. Also the Control Center won’t be able to pick up the installed version. Thx for reply. i did as you write and i had proper entry in “program and Features” but it was created before getting windows in test mode. What i had to do is uninstall driver from “programs and features” and reinstal it again. Now it works properly. Thank yuo for your work and quick reply. For all others with problems: first get windows test mode, and after that install driver. If you get problem reinstall driver in windows test mode. Hi, i can’t really help you with Touchmote. AFAIK it does not implement the fixed Windows-Wiimote HIDAPI, so “-TR” Wii Remotes don’t work. My driver makes Wii Remotes available as generic gamepads with buttons and axis. I know there are some people, that use my driver for Cemu. Though IIRC Cemu only accepts Keyboard inputs and has no gamepad support yet. So you’d need to use some other third party program to map the gamepad inputs to keyboard inputs. Ist es richtig, dass ich nach jedem Neustart die Controller aus Bluetooth löschen und erneut suchen und pairen muss? Anders gehts bei mir leider nicht. Das ist korrekt. Mit dem Control Center soll es aber auch irgendwann möglich sein die Authentifizierung korrekt durchzuführen, sodass das reconnecten richtig funktioniert. Hi! I thought I left a comment before but couldn’t find it so excuse me if this is the second time you’re reading this, but I’ve been trying to get a Guitar Hero controller to work with a wired Mayflash classic controller adapter for a while now. The Mayflash adapter takes the Classic Controllers and allows them to be used as controllers without the use of Wiimotes. I was hoping to make it work with my Guitar Hero controller because Wiimotes with Guitar Hero games can be unstable and require lots of extra configuration because the amount of input lag changes quite often. I was wondering if there would be any way to make my Wii Guitar (which is essentially a big and more complicated Classic Controller) work with your driver because yours is the first I’ve seen able to allow Guitar Hero controllers to be used as an actual controller instead of emulating a keyboard. I understand you said you aren’t able to test the Guitar Hero stuff because you yourself weren’t able to test it, but I’ve seen many people in the Clone Hero community using your driver and it works well so I was hoping the same would be possible with just a Classic Controller. Hi, yeah your last comment somehow got caught in the spam filter. Regarding the Mayflash adapter, i can’t help you with that. The vendor page doesn’t list the GH Guitar as supported controller. Its Extension ID as well as the data report is slightly different, so i’d guess it doesn’t work out of the box. From my understanding all the conversion is done by the firmware inside the adapter, so you can’t just develop a custom driver to enable that support. Though you might contact Mayflash directly and ask for support. As the adapter doesn’t work, why don’t you use a Wii Remote and connect it via Bluetooth? Hello there. I’ve been using this for some time now and I noticed a problem. Nunchuk doesn’t seem to work in your latest update. It plays as if held sideways. Is there a fix or is it a bug? Thanks for making my pc gaming much more funner btw. I just checked and it’s working for me. Is it a wired or wireless Nunchuck? Can you try another Nunchuck, Wii Remote or Extension. It’s wired. I tried with a different Nunchuk and it worked. Somehow it failed with the one that came with the Wiimote. The one that doesn’t work works perfectly with older drivers somehow. A bug, maybe? The old one came with my Wiimote Plus and Wii Mini. A red one. My old white one works with the new driver. Check it out friend. Thanks for the reply! If it works with an older driver it is indeed some regression. I changed some code to read and compare more bytes of the Extension ID (to distinguish the Classic Controller and Classic Controller Pro). So my guess is that broke your Nunchuck, as it may have a slightly different Extension ID on those additional Bytes. Is it a genuine Nintendo Nunchuck or some third party counterfeit one? Genuine. Came with a matching wiimote and wii mini. Ok, that’s strange. I’ll rework the Extension ID code that i changed. Check the latest update. I reverted the extension identifier check, so the Nunchuck should work again. I have a little problem. Everything works just fine, but when I turn off the wiimote, and then turn it on again, it does not “hook” with the computer anymore. I want to point out though that when I press a button and the lights on the wiimote start flashing, in the settings, bluetooth section, the device updates its status, from associated to connected. But in the end it does not connect. I’m sorry if i sound confusing, english is not my first language. Yeah, that is a know issue. Wii Remotes do need some special treat regarding proper authentication, which is not yet implemented. So for now, you have to manually remove the Bluetooth device and then reconnect it. Try turning Bluetooth off from the Action Center, Remove one battery from the Wiimote then put it back in, Press both 1+2 Buttons then quickly turn Bluetooth back on from the Action Center, then keep pressing both 1+2 buttons. That is what would work for me every time, and without fail. Yes, this worked perfectly, thank you. The only problem is that you can use this trick to connect only one wiimote, the other one gives an error sadly. Oh. I wish I could experiment with more than one Wiimote for you. Have you tried doing the same trick to two Wiimotes at the same time ? Yes, I tried pressing the 1 and 2 buttons on both at the same time, but only one hooks. I am certain that two can work at the same time though since you can pair how many you want with the setup. Does this Driver work with The RVL-CNT-01-TR revision of the Wiimote ? Also, Does the RVL-CNT-01-TR revision need a third-party bluetooth stack on Windows 10 ? Yes, it works with “-TR” Wii Remotes. This driver is only compatible with the MS default Bluetooth Stack. Regardless of the device driver, on Windows 10 you don’t need any third-party Bluetooth stack anyways. The MS default stack is working fine with Wii Remotes. Thank you for the prompt reply, Sir! My Non “-TR” wiimote broke, and I feel less anxious about ending up with a “-TR” wiimote now. It even sounds like an advantage. I ran the Control Center once, to enable Test Mode and install the drivers. After that, the program refused to start up again. It launches for 2-3 seconds without a window, and then loses. Have you done a reboot and tried again? What OS Version are you using? Can you check the Task Manager whether another Control Center process is already running? Can you uninstall the driver per “Programs/Apps and Features” and then try to run the Control Center again. Nochmal Danke fürs Update :). Was bedeuten eigentlich die Optionen (Kästchen) unter Classic Controller? Also Split Axes usw? They’re for the Classic Controller (Pro) and Wii U Pro controller. Like the Xbox 360 controller, they have two buttons on each shoulder. Normally it’s one button (bumper) and one analog trigger with a push-through button on each side. Pro Controllers do not have that analog trigger, only the push-through button. Anyway the options let you set their mapping. Xbox 360 Controller use one distinct axis for each trigger under XInput. But under DInput a single axis is used for both triggers. Some games need the former, others the latter. So with “Split Trigger Axes” you can switch between using one or two axes. “Switch/Swap Trigger and Bumper” lets you swap the Trigger and Bumper mapping, so the Bumper is the Trigger and vice versa. “Trigger Mapping” let’s you set whether the trigger is mapped to an axis and/or to the push-through button. That is mostly required, when you want to change the input mapping in a game. Hey, thank you for fix the axis problem. But, I had connected two wii remotes (with classic controller) and both has the same internal name (even if change the blutooh device name). The issue is system (game controllers box) recognize both wii remote like the same one (Nintendo RVL-CNT-01). Games like DBZX thinks it’s only one entry. There is a way to change the joystick’s name? Just to be sure, both controllers show up as separate node in the device manager and both have each an entry in the Game Controllers dialog? As far as i know, no controller uses unique names. So that would be weird behavior to just ignore devices, cause they have the same name. Does DBZX uses XInput or DirectInput as controller API? In case of XInput, it may be that the system only forwards one DirectInput/HID controller as Player one and does not support a second DirectInput/HID controller. So in that case the issue lies within the system and the XInput driver. You are right, there are two entries (and the same name isn’t the problem). Other games like MKX or Injustice works fine. The issue is Xinput driver (other controlles showed up the same error in this game -DBX). I’ll research for this especific solution, most likely with simulators. So, your driver is working very well and I don’t have any issues, this version is fine, no more problems. I wanted to report you that tilting the wiimote (x- and y-axis steering) did not worked on my 64bit windows with 3.0.0 driver. I moved back to 0.2.7 version of the driver and with that my RVL-CNT-01 works perfectly! 0.3.0.0 adds the Control Center and the option to disable the accelerometer axes. By default they’re disbaled, use the Control Center to enable them. The LEDs are used to display the battery charge left. Not a player number, as such concept doesn’t exist for HID controllers. So it’s intended behavior. Make sure you disabled the Driver Signature Verification. Disabling it via the Control Center Installer does require a reboot to take action. Hey awsome that you made the drivers for it. Only I have a problem, if I try to connect the wii remote to my laptop it’s saying: “driver error”. Do you know a how to fix that? Hi, via the Device Manager you can check the device properties for a slightly more detailed error message. Make sure to check the Wiimote Device under “Human Interaface Devices”. Most of the time the Driver Signature Verification isn’t properly disabled. Support of those Hero games accessories is considered experimental, as i don’t have any to verify my implementation. I don’t know if and how the turntables work. If they have the same Extension ID as the guitars or drums they may work. Hello, Good Sir. Please, do Include a Driver that allows both Mouse and Buttons + Axis to worth simultaneously. It would help a lot with some Games. Thank you. Such mode is planned. Though it is quite down the roadmap. First i have to implement raw mode and add the mouse modes. You still go ahead with the project? I have the same problem, after installed and running, the dolphin emulator fails to recognize it. Hi, no, the project is not dead yet. Up to now i tried to bundle my changes into bigger updates, especially new features should’ve been complete before releasing them. Though due to lack of spare time, plus the multiple modes not being something trivial to properly implement, i got stuck on that. Nevertheless i am going to change my release strategy now to release more but smaller updates. I am currently wrapping up, what i’ve done so far and am releasing it in the next couple of weeks. That update won’t include pass-through mode, but a new Installer and Control Tool, with some basic Driver Settings. Pass-through mode will come after that. The “Nintendo RVL-CNT-01” device node under “Bluetooth” is just a dummy node of the Bluetooth stack. The correct device node is under “Human Interface Devices”. It is labeled either “Bluetooth HID Devices” or “Wiimote Device”. Thank you very much for your work on the driver. Unfortunately, I ended up not using it. It worked with my Wiimote, but when customizing game controls, it kept picking up Wiimote motion even though the controller was motionless on my desk. You have to remove the device after turning it off before you can reconnect it again. Using this Driver requires DSE (Driver Signature Enforcement) to be Disabled. Disabling the latter impedes you from playing Games using Anti-cheat technologies (like EasyAntiCheat) for they require you to enable DSE. As such, I used a software named DSEFIX (https://github.com/hfiref0x/DSEFix) that temporarily disables DSE using an exploit. Refer to the link below for download and instructions, and read post #3 for an easy-to-use .bat file. NOTE: Although the software allows for a timed exploit before you have to re-enable DSE back (or else it would BSOD,) I have been able to switch back and forth between “Bluetooth HID Device” driver, and that made by Julian Löhr even after DSE has been re-enabled again. This is especially useful for Touchmote and other software of choice to use with your Wiimote that do not work with Julian Löhr’s Driver. Hopefully I have helped someone. UPDATE: Be mindful of which Operating System you use this ‘fix’ with. Windows 10 does have PatchGuard, and will cause a BSOD sooner or later, when it checks the kernel for modifications, which it does sparingly. Wow, I got kinda manic when i want something to work, and i wanted my Wii Motes to work on my PC to play a game with my family and tutorial after tutorial was failing me. Until i found you. Definitely saved me the money of buying other PC dedicated controllers 🙂 so sent you a small gift of appreciation.